Varun Dhawan presented a Valentine’s Day gift for his fans by unveiling a teaser from his upcoming film October. The Badrinath Ki Dulhania actor unveiled the teaser on his social media account. The teaser features Varun and lead actress Banita Sandhu but does not have any dialogues. Despite not having any dialogues, the teaser manage to keep the audience hooked to the picturization. The teaser has shown a glimpse of Varun Dhawan and Banita. Varun posted the video and wrote, “#OCTOBER. Happy Valentine’s Day to @banita.sandhu and everyone”. The film will mark the debut of the actress Banita Sandhu, who has been seen in many commercials so far. Varun had earlier shared a short video that unveiled the release date of the film. The actor had posted the video and wrote, “This year, October is coming in April”. The film will be releasing on April 13, 2018. Shoojit in an earlier interview said, “It is a genre that I have always wanted to delve in. While love and romance have been entwined with Indian cinema, there is abundance in that emotion that everyone can have their own interpretations of. Juhi and I have always tried to create stories from the reflections of real life moments that we see around us. 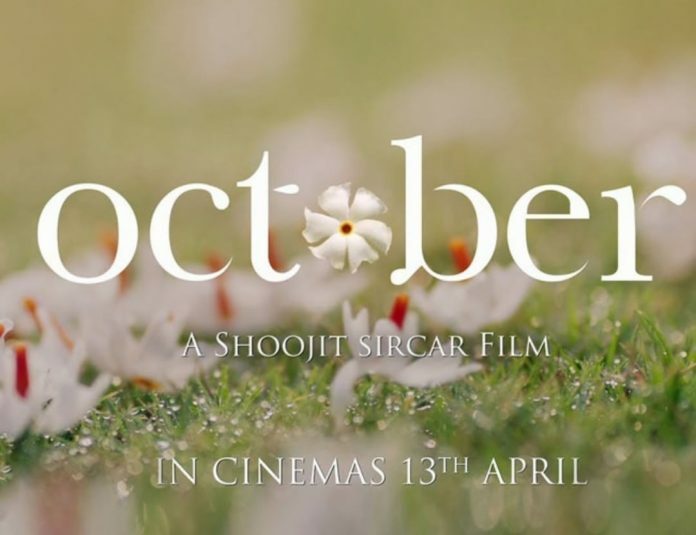 October is another effort to explore those moments out of simple situations of life.” The film is written by Juhi Chaturvedi, who has also written Vicky Donor and Piku. Previous articleAishwarya Rai Bachchan’s first look from Fanne Khan unveiled!